We’d love your help. Let us know what’s wrong with this preview of The Aviary by Kathleen O'Dell. Twelve-year-old Clara Dooley has spent her whole life in the Glendoveer mansion, where her mother is a servant to the kind and elderly matron of the house. Clara has never known another home. In fact, she's confined to the grand estate due to a mysterious heart condition. But it's a comfortable life, and if it weren't for the creepy squawking birds in the aviary out back, Twelve-year-old Clara Dooley has spent her whole life in the Glendoveer mansion, where her mother is a servant to the kind and elderly matron of the house. Clara has never known another home. In fact, she's confined to the grand estate due to a mysterious heart condition. But it's a comfortable life, and if it weren't for the creepy squawking birds in the aviary out back, a completely peaceful one too. To ask other readers questions about The Aviary, please sign up. Friends, I’m about to push a new book on you. One of the best books I’ve read in 2011 is The Aviary by Kathleen O’Dell. 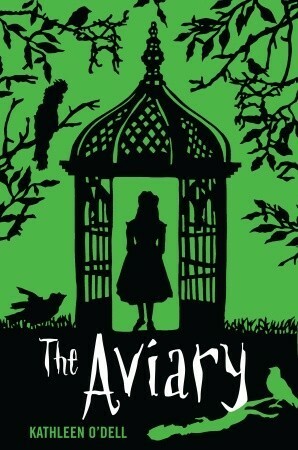 The Aviary is a quiet middle grade novel with a touch of Anne Of Green Gables crossed with The Secret Garden as an influence. It’s historical fantasy with a gothic feel, a book that DEMANDS you get sucked within it’s pages. Plus, that cover just holds your eye and doesn’t let go with the gorgeous green and the black and the birds, with the old school feel. Clearly, O’Dell was b Friends, I’m about to push a new book on you. One of the best books I’ve read in 2011 is The Aviary by Kathleen O’Dell. The Aviary is a quiet middle grade novel with a touch of Anne Of Green Gables crossed with The Secret Garden as an influence. It’s historical fantasy with a gothic feel, a book that DEMANDS you get sucked within it’s pages. Plus, that cover just holds your eye and doesn’t let go with the gorgeous green and the black and the birds, with the old school feel. Clearly, O’Dell was blessed by the cover gods. You guys, buckle your seat belts because you are about to ride the gush roller coaster. I might have rated this five stars if I'd read it as a kid. It shares things in common, thematically and in setting and somewhat in plot, with many favorite books--The Diamond in the Window, and The Secret of the Strawbridge Place, and Time at the Top, and The House with the Clock in its Walls, and oh, any book with kids in a big old house, even Gone-Away Lake, especially those with elements of fantasy. But thinking of all these masterpieces of children's literature serves only to put this book' I might have rated this five stars if I'd read it as a kid. It shares things in common, thematically and in setting and somewhat in plot, with many favorite books--The Diamond in the Window, and The Secret of the Strawbridge Place, and Time at the Top, and The House with the Clock in its Walls, and oh, any book with kids in a big old house, even Gone-Away Lake, especially those with elements of fantasy. But thinking of all these masterpieces of children's literature serves only to put this book's weaknesses on display: a less-than-convincing voice and overlong narrative. Once I realized what was going on here, the book started to drag. The climax and ending reminded me of the movies Speed and The Fugitive: you think it is over, but then there is just more movie before it ends again. There's a great deal of bumbling around and "if it weren't for those dumb kids" stuff. A couple of subplots could have been done away with entirely. My edition had, I think, 337 pages, not the 200+ listed in the description. As for that unconvincing voice: the protagonist is a girl who has never met any other children, raised in a household consisting of her mother, a middle-aged cook, and an elderly lady. I get that. I understand her speech would be weird and formal. But somehow it just did not feel real to me; SHE did not feel real, to the extent that halfway through the book I read a reference to "Clara" and thought "wait, who is Clara?". Clara is the name of the protagonist. Speaking of her never meeting any other children: for a book with a lot of discussion about who is wack, I did not feel it adequately addressed the fact that her mother is totally crazy for telling her she has a heart condition and keeping her locked in the house with brief visits to the yard only. That is certifiable and also child abuse. Even worse than, say, Colin in The Secret Garden. It edges toward Flowers in the Attic territory. Sometimes I don't feel like writing a review. Clara Dooley is an 12 year old girl sometime in the late 19th Century,who lives with her mother who is the housekeeper in an old run down an old run-down house belonging to Mrs Glendoveer the widow of an once world famous magician. Since Clara has a weak heart since birth she is not allowed to go to school or to go outside unsupervised so she spends her time helping to care for Mrs Glendoveer who still grieves for the loss of her children several decades ago. Mrs Glendoveer owns five exotic birds Clara Dooley is an 12 year old girl sometime in the late 19th Century,who lives with her mother who is the housekeeper in an old run down an old run-down house belonging to Mrs Glendoveer the widow of an once world famous magician. Mrs Glendoveer owns five exotic birds,a cockatoo,a mynah bird,a kiskadee and a honeycreeper. They are kept in an aviary and Clara is a bit scared of them since they like to screech and make a horrible noises when they see her. The enormous black iron cage, almost as big as Clara’s own room, was backed up against the corner garden wall and sheltered under a pergola with a tattered roof. At the sight or sound of a human being, the birds inside would flutter and scream as if they were on fire, grasping at the bars with their sharp claws. Judging from the noise, anyone nearby would have thought there were at least a dozen birds, but Clara knew there were only five—a mynah with a saffron mask surrounding blood-red eyes, a white, sulfur-crested cockatoo, a noisy black grackle, a fearless yellow kiskadee, and a terrified foam-green honeycreeper who pulled at his own feathers. Many times Clara wished for the birds to disappear so that she could roam the garden in peace. But strangely, old Mrs. Glendoveer loved the birds as much as Clara feared them. Per Mrs Glendoveers instructions they are to be taken very well taken care at all times even after her death. Maybe there are some unresolved things from the past that needs to be set right and Clara might just be the person who can accomplish this. The aviary was a book that I really enjoyed reading and while to some of the answers to mysteries become obvious as you read on this is a book for children after all ,I felt that that there were still some things I didnt know until the end of the book. Not only is it a tale with supernatural elements but its also a story about the relationship between a mother and her child,and growing up wanting to be able to make your own decisions. I like the comparision the author makes between the birds in their cage and the life Clara is living. And if you know anything of this period in time you have to suspend your disbelief that an 11 year old girl would correspond with an old man and that he would respond but its easily overlooked as you get immersed in the story. Towards the end there are some home-alone antics wich broke the mood slightly but these things I have mentioned are just small things in a very good book. Every time I stumble across a book like Kathleen O'Dell's The Aviary, I'm amazed that more readers - of all ages - don't read middle grade. The Aviary is very Gothic in setting and tone and simultaneously bursting with colorful characters, a unique combination. There are secrets and magic, plus a good dose of realism and a lesson or two as well. It actually reminded me a bit of Ransom Riggs' Miss Peregrine's Home for Peculiar Children. The main character, Clara, is a delightful character: headstr Every time I stumble across a book like Kathleen O'Dell's The Aviary, I'm amazed that more readers - of all ages - don't read middle grade. The Aviary is very Gothic in setting and tone and simultaneously bursting with colorful characters, a unique combination. There are secrets and magic, plus a good dose of realism and a lesson or two as well. It actually reminded me a bit of Ransom Riggs' Miss Peregrine's Home for Peculiar Children. The main character, Clara, is a delightful character: headstrong, adventurous, and incurably curious. I would have enjoyed The Aviary based solely on the premise and setting, but Clara made me love it. Her curiosity was engaging and infectious, ensuring that the reader was never plagued by a dull moment or stale passage, simply because Clara herself was always plotting her next move and going off on some adventure. Since The Aviary is in many respects a mystery, there are many great elements I feel I can't really comment on in much depth. I can, however, say that every detail in The Aviary comes together quite elegantly and I was left completely satisfied by the ending. I spent much of the novel hypothesizing about how everything fit together... I liked that the mystery wasn't ridiculously easy to solve, but all the pieces of the puzzle were there, waiting to be put together by the reader and the intrepid Clara. The Aviary is a charming middle grade story that takes a bit of magic, a bit of friendship and a bit of luck to tell a heartwarming story of siblings, justice and release. It is a historical novel and the first thing that will hit you when you begin the novel, or at least, the first thing that I noticed was how protective the mother seems of her daughter, the main character of the novel. Her protectiveness makes some sense when we find out that the daughter has a weak heart but still, not allowi The Aviary is a charming middle grade story that takes a bit of magic, a bit of friendship and a bit of luck to tell a heartwarming story of siblings, justice and release. It is a historical novel and the first thing that will hit you when you begin the novel, or at least, the first thing that I noticed was how protective the mother seems of her daughter, the main character of the novel. Her protectiveness makes some sense when we find out that the daughter has a weak heart but still, not allowing the girl a single friend? Nor letting her step outside the front gate? What? That just seemed wrong to me. And then we find out that she doesn’t even have a weak heart, it was something the mother and the old lady cooked up to keep the girl safe? That seemed REALLY FANTASTICALLY wrong. I couldn’t help but focus on that admittedly not so important part of the novel. Okay no, it is important. Even when she finds out that she’s in fact, totally okay, the girl is only allowed one friend. Why? This is bad parenting, you guys! I couldn’t wrap my head around the fact that it wasn’t discussed in more detail and this derailed me from the entire story which is about the birds, in case you didn’t realize. This is a clever little gothic tale aimed at middle-grade readers, but it held my interest as an adult. There's a rundown old mansion, a girl hidden away from society, ghosts, secrets and a mystery centered around the kidnapping/drowning of a family of children a half-century before and an aviary which houses a flock of strange birds. It's up to two smart & resourceful little girls to solve the mystery & fulfill a promise. (My only complaint: it's never explained WHY Clara's mother keeps This is a clever little gothic tale aimed at middle-grade readers, but it held my interest as an adult. There's a rundown old mansion, a girl hidden away from society, ghosts, secrets and a mystery centered around the kidnapping/drowning of a family of children a half-century before and an aviary which houses a flock of strange birds. It's up to two smart & resourceful little girls to solve the mystery & fulfill a promise. Een typische zondagmiddagfilm, maar dan in boekformaat. Het was allemaal nogal voorspelbaar, maar het had een aantal boeiende elementen. So I'm done with this book. I wanna read this book since long time ago I can't even recall it why. Perhaps the cover was so alluring for me. That creepy font, mysterious silhouttes, and promising blurb, yes? I love the gothic scent of this story, but honestly being confused with the time setting. Was it really set in 19th century? I thought the outside world of Glendoveer mansion was more sophisticated with the cars and trolley and no hints of horses, so it should be motorcar. I don't know, maybe So I'm done with this book. I love the gothic scent of this story, but honestly being confused with the time setting. Was it really set in 19th century? I thought the outside world of Glendoveer mansion was more sophisticated with the cars and trolley and no hints of horses, so it should be motorcar. I don't know, maybe I missed a thing or two. I love it when I knew what the birds really are, and enjoyed everytime Clara spared her time to read a book for the birds. I love it because every next chapter drew me deeper to the mystery of the missing (or the death) of Glendoveer children. It was just my favorite thing to discover what really happened to them and how terrible it was. First of all I love the Gothic Feel of it! Clara and her mother keep house for wealthy Mrs. Glenover who owns an aviary of birds which frightened Clara. One day when Mrs. Glenover is deathly ill Clara goes to feed the birds and the mynah bird sceams "Elliot Elliot" Why does he scream this? Read the book and find out! A charming middle grade read. A little fanciful, a little mysterious, with a page-turning ending. 100% clean. But once old Mrs. Glendoveer passes away, Clara comes to learn many dark secrets about the fam Twelve-year-old Clara Dooley has spent her whole life in the Glendoveer mansion, where her mother is a servant to the kind and elderly matron of the house. Clara has never known another home. In fact, she's confined to the grand estate due to a mysterious heart condition. But it's a comfortable life, and if it weren't for the creepy squawking birds in the aviary out back, a completely peaceful one too. I ordered this from Book Outlet on a whim a while back, and only just got the chance to read it. I am glad that I did, though I'm not sure this is one of my favorite reads recently. I'm not much for "mystery" books; of course, I haven't really given the genre much chance, save a few I've read in recent YA releases. I've been contemplating, recently, giving the genre a deeper look--this book was the kicking off point, I think. The characters are endearing, and while many hold their secrets very close to their chests (Clara's mom has a knack of keeping things particularly close in regards to the identity of Clara's father and other familial affairs), it becomes apparent early on that there is much more going on in the Glendoveer home than meets the eye. When old Mrs. Glendoveer dies, Clara finds herself amidst a world of mystery and intrigue...and fighting to keep the only thing she's ever really known: her home. But there are forces bigger than one little girl's dreams of safety and protection, and Clara discovers that sometimes, being "weak" means lurking in the shadows unwilling to face the world head-on. Sometimes, it's worse to be obedient. Truth be told, the writing of this novel is a bit stiff and formal. However, it's a historical mystery, set in the late 1800s; this taken into consideration, the writing becomes much less "bleach-dipped jeans" and more an attempt to fit in to other literature of the time period. As the novel goes on, I found myself much less concerned with the writing and its quirks than when I started out, so it's really not that big a deal overall. There are some...weird plot holes I'm not so sure were employed to their best. The idea that Clara's mom brought Clara up believing she had a heart condition, when really, she's perfectly healthy, is a bit... It felt more like a cop-out to me, though I'm not sure that it really was one. It should be noted that her mom DOES apologize for this later on, but...as someone who grew up with an actual illness, whose mom kept a strict hand on, it just seemed really weird that that's the excuse Clara was given for being denied a lot of life's finer points (friendships, school, being allowed outside). I'm sure Kathleen O'Dell had a reason for doing this; it just didn't work for me personally as a clear motive. Of course, Clara's mom WAS only trying to protect her; knowing what had happened to the Glendoveer children in the same house, I guess I can't fault her on her choices much. Because this is a mid-grade novel, the writing was pretty easy to follow and left little room for huge plot twist manueverings. The few plot twists employed were, for the most part, unique, giving the story a sort of fantastical feel. The coupling of historical, mystery, and the paranormal is one I haven't seen done often in writing, and was a refreshing break from my reads of late. The ending was pretty cheesy, and seemed to go quite a bit quicker than realistically possible. The fact that everyone is "happily ever after" after only about...ten hours of the climax being resolved broke the mysticism for me. Oh my, The Aviary is lovely. It’s the beginning of the 20th century and 12-year-old Clara Dooley lives in the decaying Glendoveer mansion where her mother is the housekeeper. Clara has a serious heart condition that prevents her from ever going outside, attending to school or having friends – she is simply not allowed to exert herself. She has always felt comfortable with her life and for the most part Clara is an obedient, happy young girl who loves spending time with her mother, the cook Lucy and the elderly Mrs Glendoveer. But as she grows older, she also grows restless and starts questioning her life – WHY can’t she go outside if she feels so healthy? WHY can’t she be friends with their friendly new neighbour Daphne Aspinal? And since we are on a roll with the questions: why are the five birds in the mansion’s aviary such creepy creatures? And did one of them really speak the word “Elliot” to her that one day? Spooky does not even begin to cover it, especially when Clara learns that Elliot was the name of Mrs Glendoveer’s young son, kidnapped when he was 5 months old. And then Mrs Glendoveer passes away. In her will, she leaves a small stipend to the trio so that they can keep Glendoveer mansion’s doors open in the hope that Elliot will eventually return. And just then, all the other birds in the aviary start communicating with Clara, who discovers a much darker, heartbreaking secret about the Glendoveers’ past. It bears repeating: The Aviary is a lovely, lovely book. From its start that shows us how lonely and restless Clara is to the beautifully rendered ending that brought me to tears (of the good kind) The Aviary is an incredibly engaging novel with an old-fashioned feel. It features a well-executed story of decades-old mystery that is slowly revealed to the reader through Clara’s eyes, a horrendously sad back-story and all of it with a side of magic and awesome female characters that drive the story forward. With regards to the mystery: some things are indeed very easy to guess (although I was pleasantly surprised by at least one twist) but that doesn’t matter because The Aviary is not a book about the mystery after all (even though the mystery is extremely important), rather it is a story about the people whose lives said mystery touches. As such, it the inhabitants of Glendoveer mansion – both past and present – that truly make this book outstanding. Clara is a great protagonist and I adored her arc which took her from utter compliance to sheer activeness through questioning. She is curious, fierce, loyal and she just grows in front of our very eyes into an awesome young lady. She is not perfect and often struggles with understanding how she can be envious of people she loves or how she can outright lie to her mother when necessary (even as she feels guilty about it), kind of halfway trapped between responsibility and recklessness. And then of course, you have the Glendoveers – but about those I can say not more without spoiling the story. Above all, I loved the characters here and the relationships formed between them. Like the fraught yet loving relationship between Clara and her mother or the hot-and-cold one between her mother and the cook Lucy. But above all, I absolutely adored the friendship that develops between Clara and Daphne from beginning to end. It was just so lovely to see this loving, funny, caring friendship between these two girls developing and growing into bonds of deep sisterhood (their words, not mine). I read this book because Amazon recommended it for people who liked The Night Circus. I lOVED The Night Circus, I wanted to read something in a similar vein, and the description sounded interesting. It wasn't similar. I suppose this wasn't suggested as a similar book because a magician is involved in the story...but really, the similarities end there. For one, this is a young adult book and The Night Circus is not. I often read YA books (and enjoy them greatly) but I just wasn't prepped for this I read this book because Amazon recommended it for people who liked The Night Circus. I lOVED The Night Circus, I wanted to read something in a similar vein, and the description sounded interesting. For one, this is a young adult book and The Night Circus is not. I often read YA books (and enjoy them greatly) but I just wasn't prepped for this to be a YA book. It is told from the point of view of the main character - a 12 year old girl who's been sequestered to her house due to a heart condition. She is the daughter of one of the caretakers of the house. When the resident of the house dies - she leaves behind her aviary of birds. The mystery of the story revolved around these birds (who never seem to age) and the kidnapping/murder of the children of the family. I have to say, I thought the book a little bit creepy. At parts I thought - I'm glad I'm not sitting alone in the house reading this (although full disclosure...I'm easily freaked out.) It was a journey of discovery and one that ended happily if not a bit too happily ever after. BUT as much as I am easily freaked out I am a sucker for all's well that ends well. This review has been hidden because it contains spoilers. To view it, click here. This was cute. Not amazing but it was quite a nice read. I had sort of the same problem with it as I had with The Graveyard Book by Neil Gaiman. It felt too much like 'just' a children's book. It felt a little too simple. Maybe I expect too much from my children's books, I don't know. I just feel like, just because it is for children, doesn't mean it doesn't have to be spectacular. What I mean is, the stakes weren't high enough. It felt more like an episode of a television show than a full lengt This was cute. Not amazing but it was quite a nice read. I had sort of the same problem with it as I had with The Graveyard Book by Neil Gaiman. It felt too much like 'just' a children's book. It felt a little too simple. Maybe I expect too much from my children's books, I don't know. I just feel like, just because it is for children, doesn't mean it doesn't have to be spectacular. What I mean is, the stakes weren't high enough. It felt more like an episode of a television show than a full length movie. You know what I mean? That isn't to say I didn't enjoy this read. I liked the dialog and I liked the creepy aspects of the story. Those really drew me in. The birds are terribly intriguing to me and I love the whole 'old mysterious house' vibe the book has. That stuff is right up my ally. I liked Clara. I found her quite adorable. She was kind and dreamy but not a pushover. Her mother and Ruby were well rounded characters as well, though I wish we knew a bit more about Ruby. I was a little bit confused by the two little girls' relationship. Their adoration for each other was so intense it felt a little odd. Maybe I just didn't get it? I can sort understand Clara's excitement, as she's never had a real friend her age before, however Daphne kind of freaked me out. It was to the point that for most of the story I didn't trust her at all. I was looking for a mystery to read....and didn't realize I was somehow in the Young Adult section! Similar to the loved childhood stories like "The Secret Garden", this has mystery, a surprise, interesting characters and two brave young girls! It's a wonderful story for very young adults, like 5-8th grade. Nice to see there are so many new good books out there for children. If you have a child and they love a mystery, I highly recommend it. Also, no foul language, very little violence, set in t I was looking for a mystery to read....and didn't realize I was somehow in the Young Adult section! Similar to the loved childhood stories like "The Secret Garden", this has mystery, a surprise, interesting characters and two brave young girls! It's a wonderful story for very young adults, like 5-8th grade. Nice to see there are so many new good books out there for children. If you have a child and they love a mystery, I highly recommend it. Also, no foul language, very little violence, set in the early 1900's it's very wholesome. I'm sure that is difficult to find these days!! Despite this book being more for young adults, around 10-16 year olds, I quite liked the idea behind the story, and as I was just out of that age range at 69 years old, I thought why not? As it says on the tin there's talking birds, ghostly happenings, and family secrets and kidnapping. Yes, I quite enjoyed it, though at times the style did seem junior/high, but nonetheless a lovely story for the young 'uns. I had trouble getting past the "grown-up" tone of the girls' dialog. I just can't imagine that even in 1905 twelve-year-old girls used words like "embellished" in a conversation. And the confrontation at the end of the novel between the girls and the villians required a lot of supension of belief. Blew. Me. Away. Best book I've read all year (which isn't saying much), and probably last year, too (which is). Slightly trippy/tidy ending, but the rest of it, well, I was hooked from approximately the first paragraph, all the way to the end. I will be shoving this in everyone's hands I can...starting with Marissa's! The Aviary has so many exquisitely written layers, even though I'm only halfway through, I could reread it from the beginning all over again and discover something new from its mysteries.. Such a beautiful, well written book, and so underrated. Solid middle grade, had a cool Victorian feel, with formal and polite dialogue and an interesting plot. I would've loved this as a 10 year old, but once you get the "twist" (I got it 90 pages in) the rest seems a bit pandering. But still a solid read! I think this will appeal to fans of a Drowned Maiden Hair. The child in me loves a mystery novel with an adolescent as the hero/heroine. This was a great, easy read.